What was I thinking 23 years ago? We moved into a rambling old house in Defiance, Ohio, and I proceeded to yank out the hostas in the back yard. They were an oddity to me: weird, spiky shoots poking out of the ground by mid-April. 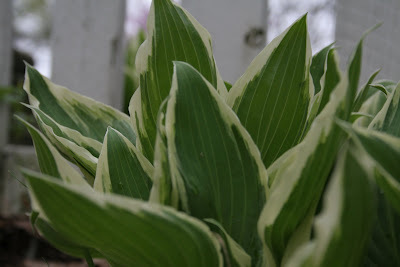 Where were hostas in my youth? 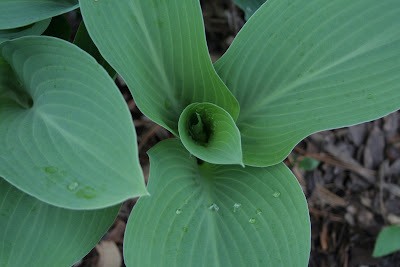 I roamed our yard and woods as a girl, never spotting a single hosta. Pity the lack of them. In googling around, I learned that hostas originated in Asia, but good grief, were brought to Europe in the 1700's so surely they've been in the U.S. awhile. Just not in my plant-o-sphere. Now my four babies are grown and I marvel at my babies in the flower beds: hostas in various stages of earth-poking, in fresh kitchen-wall-greens and rich blue-greens. Broad leaves and variegated slim leaves. Tiny new babies seeking a place in the garden, and granddaddy hostas enjoying their established spots. By July they will be glorious: a show of full foliage, overlapping and bursting over one another. And finally, their blooms will rise on swaying stems in the August breeze. If you're prone to googling and hosta-learning, there is -for real - an American Hosta Society and evidently the hosta was named after an Austrian botanist, Nicholas Thomas Host. Kitchen walls are a terrible thing to waste. 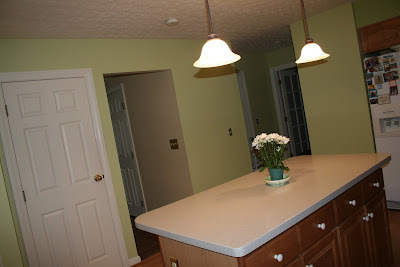 Two years ago, or so, my dear daughter Katie convinced me to paint a part of the kitchen green. I call it "tennis ball green." It popped! It caught the attention, for better or worse, of every visitor. 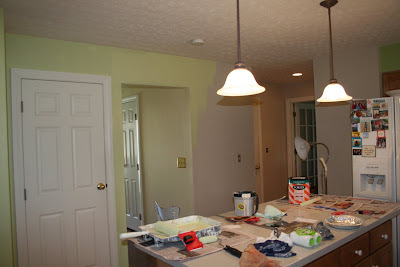 It also made the other kitchen walls glaringly drab and dingy. Four kids with a penchant for flinging shoes and book bags, one dog, and endless family life and celebrations had taken a toll on those poor walls. So when a "two gallons for one" card from my favorite paint store arrived in the mail, time was of the essence. To paint. Deadline: April 30. I am nothing if not indecisive about many things, including selecting paint colors. You'd think it was an earth-changing decision, like whether or not to invade Normandy. "It's just paint, for crying out loud!" I scolded myself. And so, color selected: two shades lighter than "tennis ball green," it is "mint chiffon." Very 1950's-ish sounding, don't you agree? Makes me want to put on some pearls and an apron. As hubby left on a business trip yesterday, I swung into action: Paint, stir sticks, spackling, sandpaper, rags, newspaper, brushes, rollers, an extra lamp. Seven exhausting hours later, the first coat was complete. I even moved the refrigerator! About 11 p.m., I was comatose on the couch and awoke two hours later, feeling as if I'd run a marathon. Admittedly, I've never run a marathon. But I didn't feel so good. Note: my friend Lisa observed that "you always do these projects when Bill leaves." Yes, I do, and I love it. In a skewed way, it feels like a little vacation. Go ahead and analyze me. "things I don't know how to do." In case anyone magnanimously wants to run to my rescue and teach me, I might add, "... and is too lazy or disinterested to learn." I do like to learn many things. In fact, I will drive myself bats learning to master something that grabs my attention. But not all things. Here are some things I don't know or understand and probably never will. Bollywood. It has something to do with Hindi-style dancing...but why that name? Certain computer functions.... like spreadsheets. Using a GPS. What's wrong with maps? How to operate call-waiting. How to put people on hold. I'm really not such an important person that two people need to talk with me simultaneously. How to operate the DVD player. I'm not making this up: I've never played a DVD myself. So I've never watched a movie alone. Maybe that needs to change. The rules of football. I have asked Bill, but I really can't remember what it all means. I think he thinks I'm kidding when I ask. Shop for a car. B-O-R-I-N-G. Unless you count how the car looks and if it's comfortable. Sorry, sexist stereotypist I am. Texting. OK, I can do it, but it's terribly laborious. Abraham Lincoln said, "you can't be all things to all people." So I won't try to know everything ... but I do know a few things. Like how to raise kids, cook my face off, drive stick-shift and paddle a kayak. That's pretty good, isn't it? What do YOU care not to know? April 15 looms large in many a mind. Today people are frantically pushing the limit of the tax deadline. And 97 years ago today, the world's newest and supposedly unsinkable ocean liner met its final, frigid fate in the north Atlantic. The Titantic took more than 1500 lives with her. But on my calendar, it's my younger brother's birthday. Mark is turning 52 today. Even though he towers over me and is a grown man, I still think of him as my little brother. I was born with a high bossiness quotient and Mark inherited a high compliance quotient. The combination had predictable results. My earliest memory involves stuffed animals and a hall closet. I dragged Mark through endless games created in my own mind, shoving the poor kid in a closet and ordering him to stand guard over our stuffed animals. He cheerfully complied, never questioning my authority. One day at lunchtime mom perched us on tall stools to eat our lunch. Mark lost his balance and crashed to the floor, the leg of the stool puncturing his chin. My job was to hold a cloth diaper to his bleeding chin on the ride to the hospital. A little queasy, I put up a brave front as the dutiful big sister. It might have been the only time I was his servant rather than the reverse. Because of his innate goodness, Mark overlooks the failures of others, including his bossy big sister. He has endured heartache in his life but manages to navigate the rough waters, patiently looking for the sun and smoother sailing. Sunny skies and a happy birthday, Mark! I hope you enjoyed this Easter day with someone special. 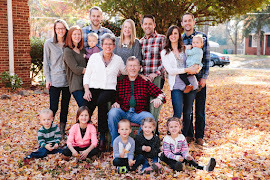 We had two of our kids at home, but the other two live out of state and my silly mother heart wanted to know they were anywhere other than alone. It was especially good to talk with both sons (and daughter-in-love) today and learn that they received invitations to eat with friends. Big, extended family gatherings where my children felt right at home. I'm thankful for the generous people in the world who include my children in their lives and am reminded to be such a person, too. Today is Good Friday, commemorating the end of Christ's earthly life. For years I thought, "what a terrible thing to happen to Jesus. And if he was God, why did he let it happen to him?" Oswald Chambers expounds on this. The Cross was not something that happened to Jesus - He came to die; the Cross was His purpose in coming. God came in the flesh to take sin away, not to accomplish something for Himself. The Cross is not the cross of a man, but the Cross of God, and it can never be fully comprehended through human experience. The Cross is God exhibiting His nature. It is the gate through which any and every individual can enter into oneness with God. Further, it is a grave error to believe that we can earn our way to heaven. God won't admit "good people" because a holy and perfect God keeps a perfect heaven. Only perfection is allowed. The solution was a perfect savior who would take all our sins to the cross with Him. (1 Peter 2:24) All we have to do is accept His gift. It's a puzzle, isn't it? It defies human logic. Which is why God is God. And why a "terrible" event is indeed very good. Good Friday. It's official. The 2009 baseball season is open for business. Lots of games. Wins, losses. Extra innings. Night games. Hot dogs, popcorn, nachos and cold drinks. Why is it I - a declared non-sports fan - embrace a sport that stretches from the snows of April through the chill of October? Basketball, hockey and football last way longer than necessary, a blurry blob of indecipherable rules and men disguised in helmets and pads so that they all look the same. But baseball. It feels good. It sounds good. The players are distinct people with personalities. The return of baseball is like an old school friend who's back in town for a fun visit. Does our taste in sports come from our parents? My dad loves football and always did. But I never "got" football. My brothers followed baseball, as did my mother. She joked that she became a baseball fan in spite of herself. When World Series games were played in the afternoons, my brother instructed mom to keep box scores until he arrived home from school. So as she ironed on October afternoons, she kept the stats with pencil and paper at the end of the ironing board. This exercise thoroughly hooked her. Baseball is a thinking man's game. This fact occurred to me when my son David played on the dusty field at the local park. His face knotted in concentration, David strategized all possible plays while his teammates picked dandelions in the outfield. It was then I finally "got" baseball. Baseball is relaxed. Really relaxed. My father calls it "watching a glacier." But I find the game so very soothing on a hot summer night. In fact, it's one of the few sports that is enjoyed outdoors in warm weather. 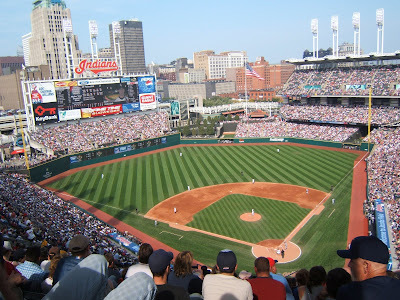 And right now (it snowed in Ohio today), a baseball game in warm weather sounds mighty good. Take me out to the ballgame. And you can buy me some peanuts and crackerjacks, too! 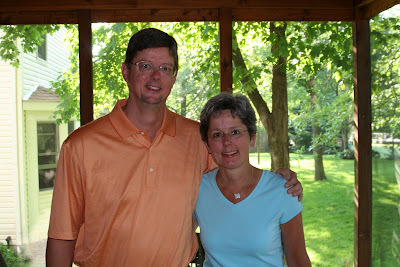 The winning blog post is by Dave Haller. Yes, he's related to me, but my objective opinion is that he's one good writer. College is a time when intelligent people do stupid things. Sometimes it’s a carefully calculated prank, other times a self-destructive habit. And every once in a while you encounter the stupid-doer in a class of his own: the straight-A student without one crumb of common sense in his attic. Who doesn’t believe in sensory feelings like “cold” and “hot,” and proves it by wearing shorts around campus during the iciest winter months. Who has no concept of personal space and no interest in obtaining a driver’s license. Whose idea of a perfect meal is mozzarella sticks and coffee. This former classmate of mine shall remain anonymous. One night a small group of us was walking back to our dorm from an event across campus. Always on the prowl for mischief, we spotted a few students studying in the library foyer. They were sitting ducks, unable to see out the floor-to-ceiling window because of the reflection inside. The possibilities were endless! From the sidewalk 30 yards away, we stopped to weigh our options of how to spook them. Not ten seconds later, with no warning, our protagonist took off in a lumbering sprint directly toward the window. It unfolded like slow motion: he collided with the glass and fell backward like a stunned bird as the window shattered. The bookworms inside leaped out of their seats with screams we could hear from the sidewalk. Forget the academics; it’s brainless episodes like these that I miss most about college. Sometimes even my student loan payments carry a certain whiff of nostalgia. Dave Haller lives and works in St. Petersburg, Florida. Although he's graduated from college, he still appreciates pranks and practical jokes. My mother loved trying to catch us in an April Fool's joke. One year my brother got her by running upstairs the morning of April 1 yelling, "the basement's flooded!" Mom totally fell for it and my brother fell out laughing. My own crowning April Fool's joke came at the expense of my gullible young children. Standing at the living room window, I hollered: "look at the deer in the front yard!" Four squealing children trotted in, "where, where??" At the perfect moment I ran to the back of the house, calling, "now they're in the back yard!" as the kids clambered along, hoping to catch sight of the suburban deer. And so it went until I could keep it up no longer, dissolving in giggles. My son David called this morning with a long tale of a scary experience at a gas station last night, involving a gun. He ended with, "I can't believe I made it to April first!" The kids are now fooling me.